From as early as I could think of, I have been around the ocean growing up in southern California. We always spent our summers camping out at the beach surfing at trestles, Huntington, or Newport in my dad’s motorhome that looked like an orange and white ice cream truck. But, I could never find my place in the ocean as I was a little kid competing with adults for waves. I would sit on the inside waiting for a spare wave or someone to wipe out but usually ended up going through the wash cycle when the big set waves would come. My life changed when I was around 12 years old my dad got me a pole spear for Christmas. If you give a little kid something to shoot things with, they are going to go out and do it. This took me into this new fascinating world that I never knew existed through the kelp forests of Laguna, California and the best part, there were no lines I had to wait for. After that, I was hooked. I also remember I would always try to compete with my older brother to see how long we could hold our breath or how far we could swim in my grandfather’s pool playing all kinds of pool games like marco polo or colors. Spearfishing originally got me into freediving. Spearfishing isn’t very difficult in Southern California as you only have to dive around 30ft. Once I moved to Hawaii, I realized very quickly that I was not as good as I thought. Through a friend I learned that there were actually freediving courses available so I wanted to learn as much as I can. That is when I sought out Martin Stepanek with Freediving Instructors International, who has been a huge inspiration to me. Freediving has changed my life in a positive way and I have really found out who I was on my journey to achieving greater depths. It seems like every time a barrier would form in my freediving it was something in my life that needed to be changed before I can break through the barrier. This is why I owe myself to freediving because it has helped me dissolve many issues in my childhood and in my life so that I can become a better person. The only goal I have in freediving is to continue to learn about myself as I continue my path on achieving new depths. 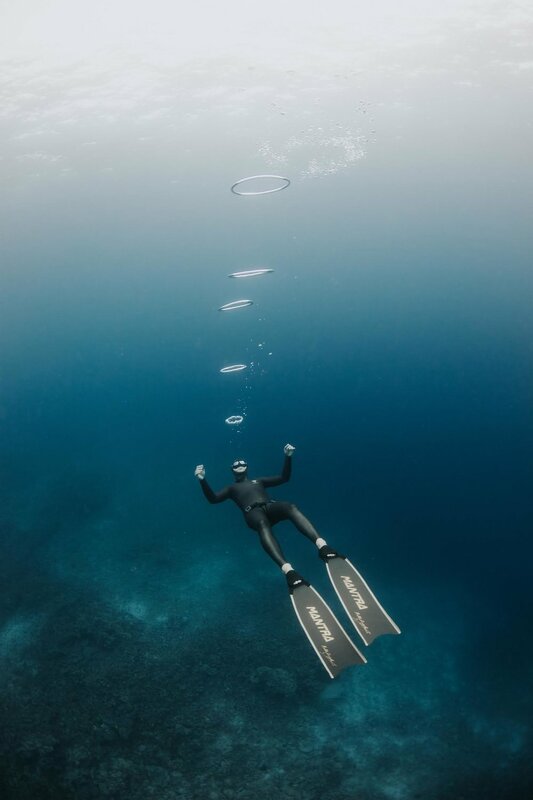 I have always dealt with anxiety during school and test taking, so this is one of the main reasons why I started a road on competitive freediving to see if it is possible to overcome this. I am a freediving instructor with Freediving instructors international, so freediving is literally my entire life. I love the art of skateboarding as another hobby as this is what I did as a kid for a long time. It taught me to be very patient and to never give up trying to land tricks for endless hours. I don’t skateboard too much anymore so that I don’t risk getting injured but I still like to keep up with the progression of the sport. But I think the mindset I learned from skateboarding has really assisted my freediving in reaching deeper depths. Follow your dream and never give up. Never let someone tell you that you can’t do something. Don’t tell yourself that you can’t do something. If your dream is freediving give it all you have and more. Through freediving I have learned that the body and mind possess a lot more abilities than we know, so keep trying.